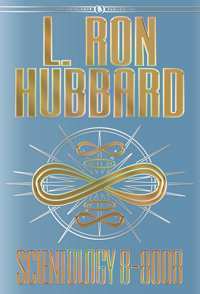 This renowned series stands as the largest single body of work on the anatomy, behavior and potentials of the spirit of Man ever assembled, providing the very fundamentals which underlie the route to Operating Thetan. Here it is in complete detail—the thetan’s relationship to the creation, maintenance and destruction of universes. In just those terms, here is the anatomy of matter, energy, space and time, and postulating universes into existence. Here, too, is the thetan’s fall from whole track abilities and the universal laws by which they are restored. In short, here is L. Ron Hubbard’s codification of the upper echelon of theta beingness and behavior. 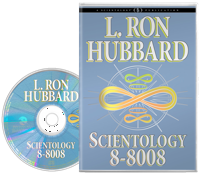 Lecture after lecture fully expands every concept of the course text, Scientology 8-8008, providing the total scope of you in native state. Includes accompanying reproductions of the original 54 LRH hand-drawn lecture charts. Throughout history, mysticism, philosophy and religion have postulated the existence of the human soul or spirit. In Eastern thought, an individual worked to attain a state of personal enlightenment, free from the material world. Christianity itself was based on the hope that the spirit of Man could transcend death. Yet despite Man’s theories and hope, he had no proof. And in our modern era, where the rationality of science became preeminent, the very existence of the soul came into question. After all, no one had seen it, measured its dimensions or monitored its energy output. And so Man doubted. And the human spirit became a thing of superstition, of mysticism, of faith. And the new priests of materialism could dictate that Man’s hopes, dreams, creativity and ethics were simply the product of chemical interactions in the brain. It was into this world that L. Ron Hubbard stepped—and not lightly. Trained both in the spiritualism of the East and the uncompromising practicality of the West, he dedicated himself at an early age to finding out the truth of exactly what Man was—whatever that truth might be. 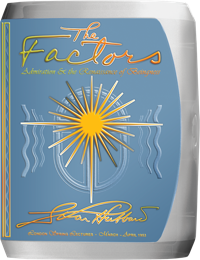 His relentless research in Dianetics had at last unlocked the secrets of the human mind. The phenomena of mental image pictures and their hidden impact on Man had been tested and documented in case after case. Yet still questions remained, pieces of the puzzle that did not fit into the overall picture. For one thing, in the search for aberrative incidents, preclears sometimes slipped into past lives. And, perhaps even more surprising, the aberrations then resolved with fast and dramatic results. This research revealed that both the age and the potentials of the spirit had been vastly underestimated—as had the complexity and viciousness of the incidents which had aberrated and trapped the being in a body. With whole track recall stretching back into trillions of years, the number of aberrative incidents to be run stretched into the multibillions. Attempting to address these with Dianetics engram running would be a daunting task. So Ron began looking at the problem from a different angle: why do such facsimiles stick to a spiritual being in the first place? Could the isolated parts of Man—spirit, mind, body—be pried apart from each other? With this, in one pivotal moment, L. Ron Hubbard isolated the human spirit, not as an entity or force separate from the individual, not as a “soul” that one “sent to heaven,” but as the personality and beingness which actually is the individual and is aware of being aware. This theta being, or thetan, he found, is immortal and is possessed of capabilities well in excess of those hitherto predicted for Man. By exteriorizing the thetan from the body, the long-sought goal of religion—spiritual existence independent of the body—had been accomplished, rationally and systematically. What was needed was a thetan who knew enough to handle the problems of the MEST universe, knew enough about universes to handle and protect his own and who knew enough of the track and what happens in the MEST universe so that it could not happen to him again. In sum, an Operating Thetan. Bridging from Homo sapiens to the state of Operating Thetan, or OT, required a firm foundation of knowledge—both of one’s own spiritual abilities and the anatomy of entrapment. Accordingly, in late 1952, Mr. Hubbard began preparations for a comprehensive course, commencing in Philadelphia on 1 December 1952. In his letter to the Hubbard Foundation of Philadelphia, he committed himself to an extensive lecturing schedule to cover the breadth and scope of this material, up to 5 lectures a day for a total of 45 lecture and demonstration hours. In fact, he would well exceed even this, giving a total of 62 lectures over an 18-day period, with 14 supplemental lectures given the following January in London. Knowing that the information he was about to deliver would need to be disseminated from Philadelphia to the rest of the world, rapidly and without abridgement or alteration, he also arranged for the lectures to be professionally recorded. One of the Philadelphia Foundation students was also a recording engineer for RCA and provided then-state-of-the-art recorders and microphones to make what would be the first-ever high-fidelity tapes of his lectures. And so Mr. Hubbard proceeded to lay out, in detail, the results of his research into the nature, abilities, potentials and capacities of the thetan. The scope of the material was vast, encompassing the entire range of human and spiritual activity. He described in detail the relationship of a thetan to a body and exactly how a body is controlled and run by a thetan using energy flows and motor controls. But even more fundamental, he explained why a thetan has a body in the first place and how, step by step, the spirit got attracted to, interested in and finally dependent on a body. In lecture after lecture, he detailed the thetan’s relationship to the material universe of matter, energy, space and time while further revealing a gradient scale of beingness, from the lowest state of being completely in agreement with and controlled by the MEST universe, to the highest states where a being creates his own universe. By the end of the course, Mr. Hubbard had delivered a total of 62 lectures, each lecture an hour in duration, with a total of 54 accompanying charts, hand drawn during the course of these lectures. The following month, another 14 supplementary lectures were delivered in London, making 76 lectures and comprising a monumental body of knowledge on the full potentials of a thetan. 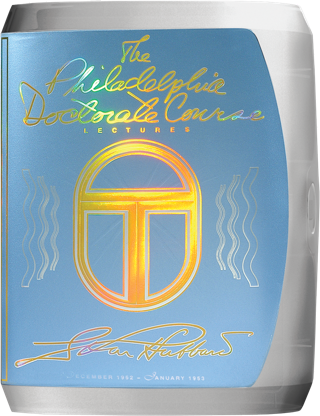 The Philadelphia Doctorate Course and its text, Scientology 8-8008, stand today as the largest single body of work on the identity, character and potentials of the spirit of Man ever assembled. L. Ron Hubbard was to devote the next thirty-four years to the full development of The Bridge to Total Freedom, providing the step-by-step route anyone could travel to achieve their full spiritual potentials described in this course—Operating Thetan.